The power supply is provided from the utility via a 20 kV medium voltage cable and three special transformers – two of them with 250 kVA each and one with 400kVA – able to provide a maximum voltage of 1250V AC three phase and a maximum continuous test current of 630 A. These mains transformer allow a voltage adjustment in steps of about 10V for lower voltages, increasing to steps of about 20V for higher voltages. Further fine adjustment is performed by additional step-up or step-down transformers or by autotransformers for continuous currents up to 500 A. 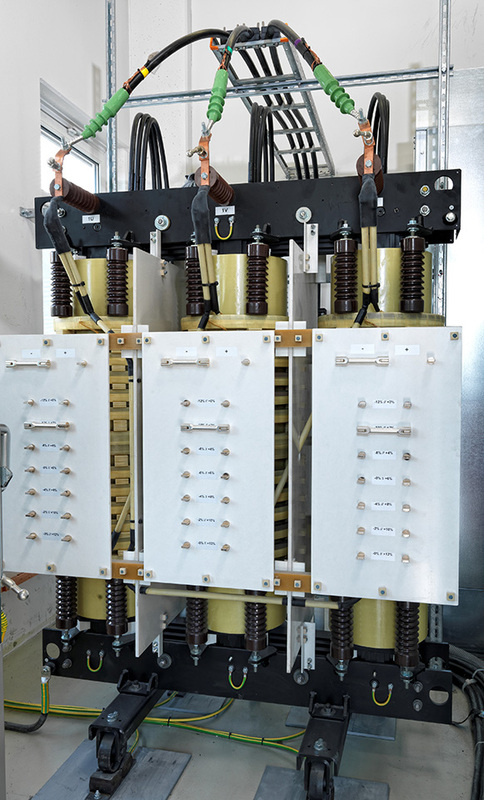 Additional single phase and three phase transformers for independent test setups are available up to 130 kVA covering a wide range of voltage and current ratings up to 1200V and 1200A. Above that special setups providing up to more than 2500V AC are possible, e.g. for TOV-testing. By use of 6-pulse or 12-pulse rectifiers test voltages up to 1600V DC with continuous currents of currently about 300A can be reached. These can be performed up to the limits given above and beyond, taking into account the equivalent maximum continuous currents. Tests exceeding these capabilities are performed in cooperation with partner laboratories. Multi-channel temperature recording devices with a maximum of 20 channels per unit are in use and CTI is able to perform measurements on powered components and devices with voltages up to 500V AC between channels. The actual limits for dielectric tests and pure surge voltage tests are 12kV AC/DC/impulse. Standard waveforms are 1,2/50 and 10/1000, other waveforms are possible upon request. Hybrid impulse tests can be performed either with a generator with an open circuit voltage up to 12kV 1,2/50 and a short circuit current of 500A 8/20 as well as the American Ringwave 0,5µs/100kHz, or with a 2 Ohms generator impedance capable to deliver up to 24kV 1,2/50 and 12kA 8/20. Pure impulse current tests are possible at a variety of waveforms such as 4/10, 8/20, 10/250, 10/350, 10/500, 10/750, 10/1000, other waveforms are possible upon request. The maximum surge current capability for 8/20 is 150kA. The maximum surge current capability for 10/350 is 55kA. All impulse tests can be performed as powered tests with the device under test being energised from the mains. There are a number of climatic chambers, heat- and cold chambers as well as humidity chambers available, details on maximum size and test limits are available upon request. International Protection Code (IP-code) testing can be provided up to IP4X and IPX4. Tests for higher codes are performed in cooperation with partner laboratories. CTI is equipped for needle-flame tests, glow-wire tests, tracking index tests and ball pressure tests on plastic materials as well as for a variety of mechanical impact and stress tests for housings and materials.